Former Supreme Court Chief Justice Yang Sung-tae has been summoned for questioning as a suspect next week over his alleged role in a power abuse scandal involving former top court officials, the prosecution said Friday. The Seoul Central District Prosecutors’ Office has called in Yang for interrogation at 9:30 a.m. on Jan. 11, making him the first former head of the Supreme Court to face prosecutorial questioning as a criminal suspect in the country’s history. 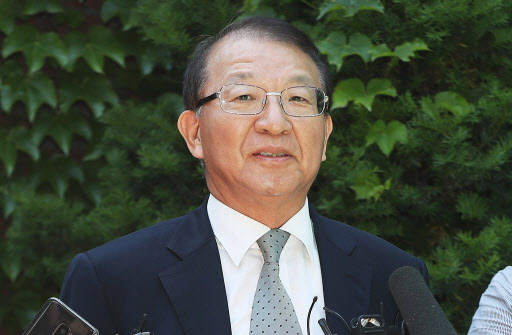 The 71-year-old former judge, who led the top court beginning in 2011 and retired in September 2017, is suspected of having sought to use trials as bargaining chips in dealings with the Park Geun-hye administration. Yang faces accusations that he ordered officials at the National Court Administration, the top court’s governing body, to find ways to interfere with trials whose rulings were politically crucial to the Park administration, and disadvantage judges who against his agenda. Among trials thought to have been influenced by Yang was a damages suit filed by Korean victims of Japan’s wartime forced labor. Yang is suspected of having abused his power to deliberately delay court proceedings for the case to curry favor with the former president, who was seeking amicable relations with Tokyo. In return, he is alleged to have wanted to win support from the government to establish a separate court of appeals and to dispatch more judges to overseas embassies. Yang has flatly denied the accusations. Prosecutors, who launched the probe into the scandal in June last year, have questioned a number of Yang’s former subordinates and arrested a former deputy NCA chief in November.